Fields: "We will continue to match production with demand and will react to the market." DETROIT (Reuters) -- Ford Motor Co. sees the U.S. sales pace of new cars and trucks in June largely in the same range as in May as the outlook for the economy remains mixed, a top executive said today. 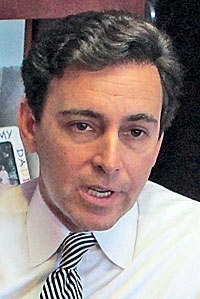 Ford North American President Mark Fields told reporters at a company event that the No. 2 U.S. automaker expects the rate for light-vehicle sales in June on an annual basis to finish in the high-13 million range. The U.S. sales rate in May was 13.8 million vehicles. Fields said the outlook for the U.S. economy in the second half of the year is "mixed," citing increased housing starts and weaker consumer confidence, but added that Ford has no plans now to limit vehicle production at its plants due to the economy. "We will continue to match production with demand and will react to the market," Fields said.